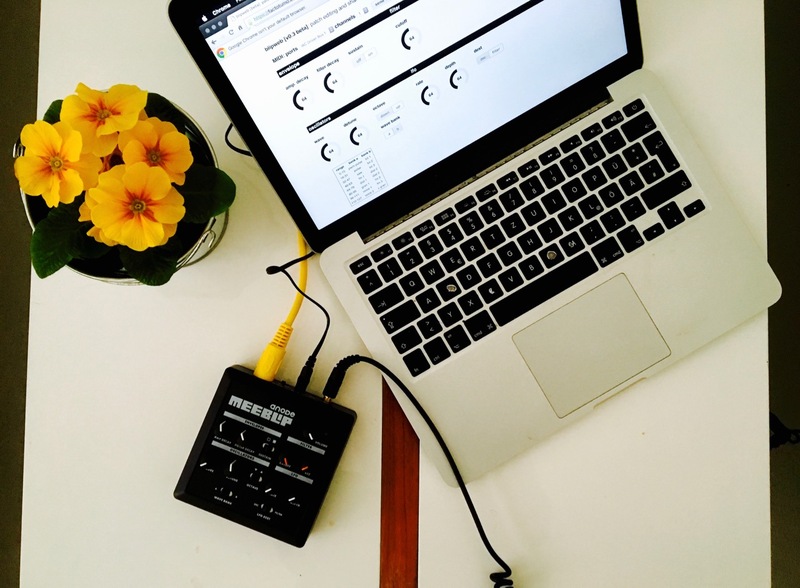 Thanks to the addition of MIDI to a new generation of browsers, a browser tab could as easily be an interface to a synth – not just a place for social media distractions of pictures of synths with cats. Now, we’ve got an (unsolicited) Web editor for our own MeeBlip synth, joining editors for Roland Boutique and Yamaha Reface instruments. 1. You can deploy more easily. Instead of mucking about with installers and operating system compatibility, all you have to do is point your browser at the right page. 2. You can share directly. Putting everything on the Web means easy integrated sharing and connectivity, and updates that happen instantly (see #1). Which synths support such a thing? Soundmondo is a site for Yamaha’s Reface synths, built by Yamaha officially. Its emphasis is on patch discovery across genres. Yamaha deserves some credit for championing the idea. breadandbuttersounds.com is a general resource site that has built homebrewed editors for the Roland Boutique line. (That’s JU-06 Juno, JP-08 Jupiter, and a forthcoming JX-03.) These are really editor/librarians in more of a traditional sense, down to representations of the front panel. And now, it’s our turn with the MeeBlip. Plug a MeeBlip into your computer via a Web interface, fire up Google’s Chrome browser, and you can send patches to your anode. Best of all, you can share your work as a Webpage (or send it via Twitter or email). Proving the “sharing” point, you can’t take a traditional editor/librarian and share a patch on Twitter. But you can using a Web editor. — posted on Twitter as https://t.co/qpQkSDFVfc gives you a “squiggly” patch for your anode. But there’s more. An update this week now lets this Web interface do stuff that essentially combines online documentation with hands-on, immediate results. Maybe you never liked reading the #$*&ing manual. But what if you could play the manual? Now, the Web interfaces supports some parameters that didn’t fit on the anode’s tiny case (glide, VCF envelope amount, LFO random, LFO note retrigger, oscillator b wave type). And you get a reference to wavetable types. You can also try a random patch. Suddenly, the browser is seeming like a logical extension of a synth. And whereas sharing source code for a “native” editor app would require a lot of work setting up a development environment and dealing with cross-platform issues, it’s also easier to share, understand, and modify the source code for a Web editor. So it makes more sense as open source code than a traditional app might. 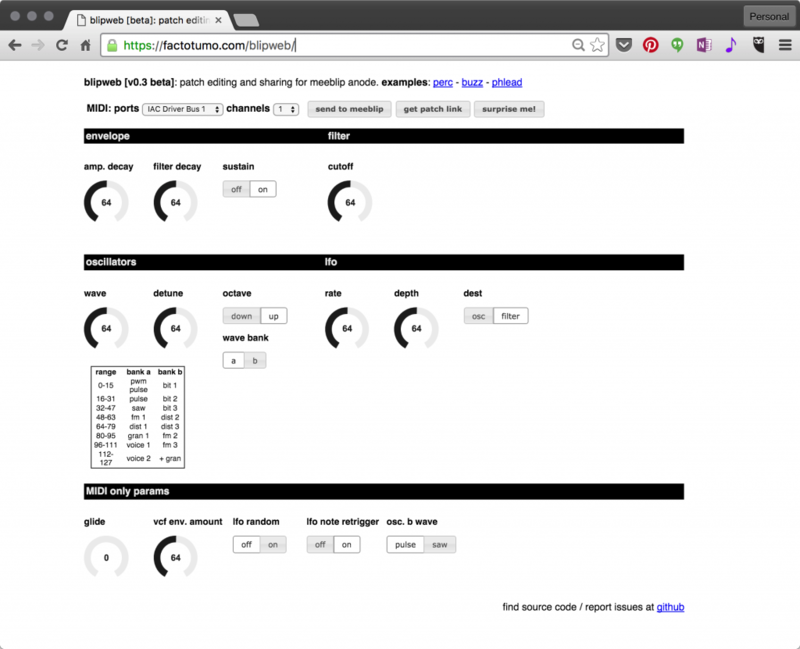 And of course, the MeeBlip (unlike the Yamaha and Roland synths) is the first open source hardware synth to have an open source Web editor (to my knowledge, anyway). I’m really excited by this. What was once sort of a strange Web hack-a-thon novelty is finally looking useful to average users. So expect more of this.